NGC 3201 is a bright globular not easily seen from mid northern latitudes. At my +38 degrees, it barely clears the horizon. 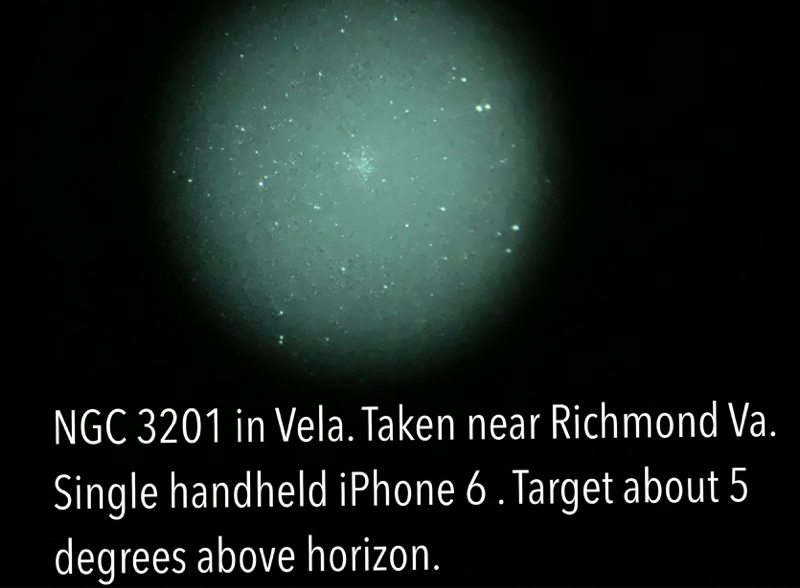 I was able to view this with night vision. The sky above my southern horizon is generally blank to the eye. A combination of light domes, atmospheric extinction, high humidity, and neighborhood lights prevents any naked eye visibility. The best visual target in Vela is bright star Gamma Velorum. Other than this, Vela has been a mystery to me. My process involves a combination of visual and NV observing. 1. First, scan the area with handheld NV. A number of bright stars and groupings are visible. 2. Identify these and open correct atlas page. 3. 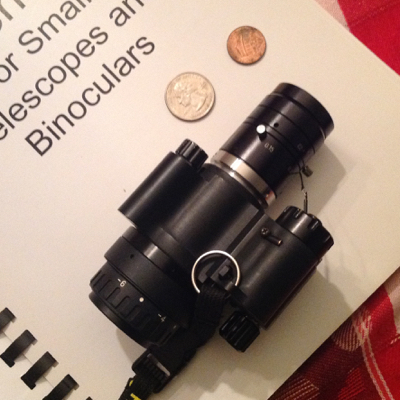 Use the 1x handheld NV to aim the telescope by viewing thru the Rigel finder. Even at low brightness the reticle is a bright wheel of fire. 4. Use the low power ep (36x) to star hop from sky mark bright star to target. Paper atlas is upside down to match eyepiece view. 5. NGC 3201 appears as a faint formless glow. 6. Hold NVD up to eyepiece and view afocally. The globular becomes defined, resolved, and easy to see. 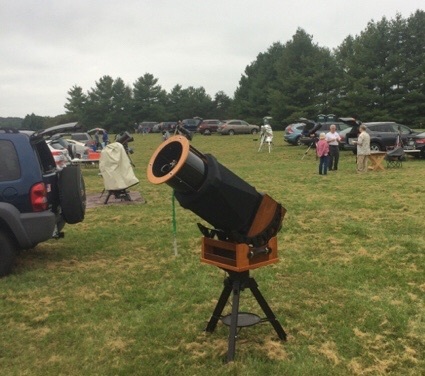 The scope is a 10” f/4 dob on a tripod. The eyepiece height when horizontal is within comfortable seating range. The pic was taken afocally thru a 31mm epwith Paracorr2. The bright double above right is an airplane! I too use a NV device aiming through the Rigel finder on the Comet Catcher or the Telrad on the 12". It makes it possible to see many objects directly so that I can get right on target. Yeah, I am able to see Globulars to my deep south (which is in the down town Austin light dome, and that is only 4 miles away) that had eluded me in the C14. Great report. Very cool picture. I have been thinking of getting a 10" f/4 myself. I could use it afocally, or with ASA Corrector. I would love one on a dob mount though. I never want to own another GEM as long as I live. Great for you! New skies!!! Nice report Ray! It's good to be able to access new points in the sky. Vela is too low for me to access. What mount do you use on the tripod for your 10" Newt? Alt/Az? It's a dob on a Losmandy tripod. The EP would be too low otherwise. It would NOT be too low for me... I was 5'6" when I was tall, but I've been shrinking for years! I like the setup. Ed, take note... it's not a GEM! This is the third time that you've said you're THINKING about a 10" f:4... man, it's time to pull that trigger! Edited by GeezerGazer, 08 February 2019 - 10:38 PM.